Home Editor's Pick Review: Viscount Caravans is Back! Review: Viscount Caravans is Back! Viscount, an iconic Australian caravan name, is back on the road. Few caravan brands have the name recognition of Viscount. At the height of its popularity, the late 1970s, it was by a wide margin the biggest selling caravan brand in Australia. Many families would have fond memories of foreshore holidays in a Viscount and, indeed, many of these vans remain on the road. It was with some delight, then, that we learned the name was being given a new lease on life by the Concept group of companies. 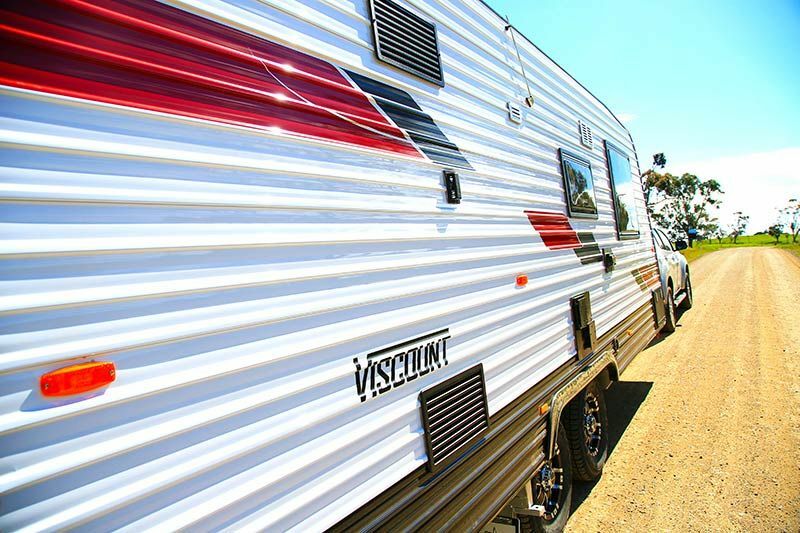 Viscount, a brand that’s so important to Australia’s caravanning heritage, is back. Viscount has made its return with five different layouts and sizes initially available – we hooked-up the tandem-axle V3 for a shakedown run in country Victoria. Principally, the new Viscounts are all about value for money. Our V3, at $54,990, is especially pleasing on that front. But anyone expecting touches of nostalgia, or a throwback to the Viscounts of yore, in the new vans will be disappointed. Modern styling and construction are the orders of the day. Our V3, with its high-profile aluminium cladding and 3mm-thick composite aluminium front, rear and roof, was the definition of contemporary caravanning. The V3 rides on a 6in Preston SupaGal chassis, with a 6in A-frame, and Al-Ko beam-axle roller-rocker suspension, with 15in alloy wheels and all terrain tyres. The underpinnings certainly appear solid but, being a bitumen-based touring caravan, there is some exposed plumbing at the rear. While the V3 was quite stable under tow at highway speeds, despite the especially strong crosswinds we experienced on the day, it did ‘porpoise’ ever so slightly on the towball. Now, this van was unladen at the time, and it does have a fairly light ball weight of 117kg (at Tare) so with some water in the tanks – which are both mounted forward of the axles – and some gear in the boot, etc., I’d expect no issues at all. The V3 has a Tare weight of 2280kg, quite reasonable considering its size and spec-level. The ATM of 2780kg gives the van a payload capacity of 500kg which, again, is a reasonable figure. Fully loaded, this van is a good match for many mid-size 4WDs, such as the Isuzu MU-X we used. For its price point, the V3 covers more than the basics. There’s a full-length roll-out awning, a picnic table, a 12V point and a couple of speakers. But there’s also a reversing camera that’s wired ready to be connected to the tow vehicle. A couple of 9kg gas cylinders are mounted up front, and there’s a tap, protected by a stoneguard, mounted to the nearside of the A-frame. In lieu of a front boot, the V3 gets a gal-lined tunnel. Because the house battery is inside, under the bed, this boot is – aside from the Camec Brake Safe unit – completely unencumbered, so there’s plenty of room for the chairs, ground mat and all the other items we pack. In terms of the van’s self-sufficiency, you could expect to live comfortable for a few days away from civilisation. With its 157L of fresh water, 120W roof-mounted solar panel and 100Ah deep-cycle battery, which can also be charged off the tow vehicle via the supplied Anderson plug, there should be no reason to hurry back to town. Overall, the fit and finish of the Viscount V3 is of a high standard. I saw no rough edges or unsightly joinery. However, one problem was actually pointed out to me by the manufacturer: the water filter cartridge under the sink was blocked by the hot water service. With a spare cupboard directly adjacent, it was a mystery as to why the water heater was put there, but I’m told it will be rectified on future models. The interior certainly fulfils the manufacturer’s mission to bring the Viscount name into the 21st century. The cabinetry is constructed of 15mm CNC-cut lightweight ply finished in glossy laminate. There’s also a generous amount of storage options, from the extra-wide, two-shelf, pull-out pantry, to the full-height pantry next to the fridge, to the many overhead lockers. There are a couple of points of difference between this and comparable vans, though. One is the fridge, a new, slimline item from Thetford that has three compartments: an upper fridge compartment with the freezer inside, and a lower drawer fridge. If nothing else, it takes up less space than other caravan refrigerators. Among the highlights: the nearside club lounge, which despite its generous size does not make the layout feel cramped. I also liked the kitchen, with its cooktop well recessed into the bench and gas burners far away from the nearest combustible surface. The front bed is surrounded by overhead lockers and side wardrobes; however, Viscount has not fitted side tables. Instead, ‘niches’ have been cut into the wardrobes – a common layout feature. Each niche has a 240V powerpoint but I’d like them to have also have a 12V point. A front window hasn’t been fitted but, courtesy of the hatch above the bed and two side windows, there’s enough natural light in the bedroom. And then there’s the bathroom. It has no windows but, perhaps due to the LED lighting and reflective surfaces, it doesn’t seem gloomy. The bathroom gets a top-loader washing machine, a cassette toilet and central vanity. Customers can choose to swap the positions of the offside shower (which has a durable Perspex door) and the nearside toilet – this would be my preference if for no other reason than doing so would make the job of removing the toilet cassette more discreet. Among the other features, the V3 has a Gree reverse-cycle air-conditioner, a microwave built into the overhead kitchen cabinetry, reading lights at the dinette and bed, and a flatscreen TV – a swivel-arm bracket is mounted to the forward end of the kitchen. It’s unquestionably welcome to have the Viscount name back on the market and I suspect it will resonate with many caravanners. While the new design doesn’t reflect that of the Viscounts of decades ago, the Viscount V3 is a well-priced touring caravan equipped for full-time caravanning or quick weekend getaways. <Great to see 'Viscount"name re-enter the RV scene. my Dad and I bought a new Viscount in 1967,I only sold it about four years ago,under pressure from the wife.It was the last of the silver finishes,and I polished it all over,and it looked beautiful.Certainly was a sad day to see it drive away. Just ordered our Viscount V3.1! Love the finishes & the price. Wanting road test-performance info on 2005/6/7 Viscount Sportz Caravans. I am looking at these years mainly for twin bed/shower and toilet. Can you help Thanks. At this stage, I can’t give any in-depth information on that model. Do any readers have any experience with it?